Export Corrupted or Healthy Exchange EDB 2 PST, MBOX EML, MSG, PDF & HTML file Format. Recover & Migrate data from Offline and Dismounted EDB file. Move Exchange EDB file directly in newly installed Exchange Server. No EDB file size Restriction (Tool is Tested Successfully with the EDB file of 1TB). Break the Resultant PST file of large size with the Split PST Feature. Mail filters Option that helps in Exporting Selective Mailboxes (Date Wise). Supports all Editions of Windows (32 & 64 Bit) & Exchange Server (2013 & below versions). Convert the Exchange EDB items including Emails, Tasks, Calendars and Journals etc. in PST file format along with the corresponding attached file. The Software will not affect Original structure of the EDB file during Conversion and users will get complete data as it is in PST File. No need to be worried about the status (whether Online/Offline) of EDB file. By using EDB PST Converter users can easily export mounted as well as dismounted EDB file 2 PST file format. The Exchange EDB 2 PST Converter software provides an option with which users can transfer EDB data directly in newly installed Exchange Server. Users can perform the entire migration without changing the status (making EDB offline) of EDB file. The tool provides an additional option with which users can easily export data of Exchange EDB file in MBOX, PDF, MSG, EML and HTML file format. Users can use these formats in different email client. By using the EDB 2 PST Converter tool users can restore the accidently deleted mailboxes of EDB file and can also convert the recovered mailboxes in required file format (PST, MSG, EML, HTML & PDF). Using Exchange EDB in PST Converter users can easily extract PST from private and public folders of EDB file. Users can easily retrieve data from EDB without log files. With the help of EDB PST Converter users can easily view and migrate data of Password Protected/Encrypted/Corrupted EDB file in PST, MSG, EML, HTML & PDF file format. Users can also extract the selective Mailbox items from EDB file using Exchange EDB in PST Converter Tool. For that just mark the required items and software will export those items in desired format. Users can split the resultant Outlook PST file of large size by using the Split PST option of Exchange EDB in PST Converter. The feature will create Several PST files of equal size. The EDB PST Converter utility is compatible with all editions of Windows OS, MS Outlook (2013 – 95) and Exchange Server (2013 – 5.0). Is MS Outlook required for conversion of EDB file in PST Format? Yes, MS Outlook is required to perform the conversion. Can I convert Public and Private Folder using this utility? Yes, You can easily convert Public and Private folder using this utility. Can I Convert Selective mailboxes items to PST Format? Yes, Tool supports conversion of selective items from EDB mailbox. What is the maximum size of EDB that I can use with this Software? That was the most difficult time for me when I lost the access of my Exchange server (EDB) files. Corruption was so deeper and I wasn't even able to open EDB files. But Exchange EDB PST Converter Tool restores all my data in a quite easy manner and also offers an option to export data in PST file format. 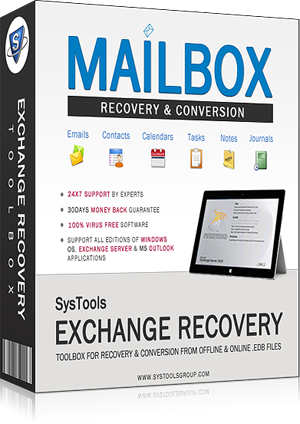 I have used Exchange EDB in PST Converter utility to get back the access of Exchange mailbox items after the corruption issues in that. Believe me; I get back all the Exchange EDB data without any alteration and save them into PST file format.